My first time at the annual meeting for National Directors of the Pontifical Mission Societies, I was thrown into the deep end of the Church's missionary work -- a weeklong agenda delving into budget and expenditures for the Societies, and exploring how to best utilize the generous offerings of the world's Catholics to meet the great needs of the Pope's worldwide missionary works. Now, this is not my first rodeo, as they say in Texas. Attending meetings and looking at the global nature of the Church are familiar to me. But, as I landed in Rome, Italy (the site for our gathering in the middle of May), I was repeatedly blown away by the breadth and depth of mission work. I was very fortunate to have my immediate predecessor as National Director and a prolific mission supporter, Monsignor John Kozar, with me for the duration to help guide me through unfamiliar waters. Imagine -- the whole world represented in the one room (not much of an exaggeration as I looked around our meeting hall). And these are not people looking down from above on what's happening in their respective countries. They're living and breathing the Church's missionary work every day. At every turn, there was another country -- and yet another face of the Church. Take Father Nabil Fayez Antoun, the National Director of the Pontifical Mission Societies in Egypt and also a pastor in Cairo. Up close, the uprising in his country, he would say, was long overdue; the tensions with the Muslim community, perhaps overplayed. The Church in Egypt is both humble and significant, needing all our support. And there was my "breakfast in Bangladesh," as the National Director from that Asian country, Father Tapan Camillus de Rozario, shared the ongoing trials of the poor there. Much of the population lives in areas prone to flooding, and, as is often the case, these are some of the poorest in that country. Consider, for example, the Garo people, many of whom are Catholic. They make a living from forest cultivation. But they are dogged by yearly flooding and by encroaching development. Local priests are very much a presence in their world, going and living where they are, accompanying them during their trials, visiting the sick, and, above all, praying with them and celebrating the Sacraments. We completed our business by the end of the second week of May. All during that time, I was reminded of how you would see things work at the United Nations, with each having one vote on the projects being presented, and all having the right to pipe up and make an intervention -- Myanmar! Zimbabwe! Guatemala! Whose voice will be heard next -- and how will those observations build Church community and presence worldwide? I can’t think of anywhere else in the Church where there is such open and honest discussion (sometimes a little heated) about how we should best support the Pope's missionary works. 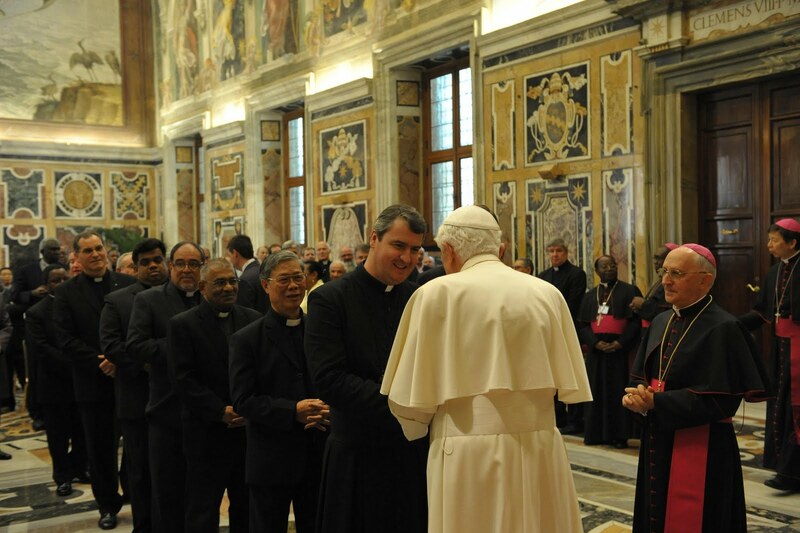 After our meeting closed, we were all herded to see the Chief Shepherd, Pope Benedict XVI, who addressed us as his own "missionary corps." 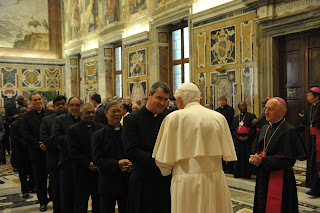 As a first-timer, I was privileged to meet with the Pope personally. "From the United States," I said in my brushed-up Italian. "Ah," said the Pope, "Great Works!" I told him we were praying for the cause for canonization of Archbishop Fulton Sheen, another of my predecessors as National Director. "Bene, bene," he said, giving nothing away. I left Rome with our Holy Father's words still ringing in my ears -- and heart -- "The Great Works." That just about sums it up, really. For all the efforts we do as faithful Catholics, few can be as "Great" as the work of spreading the "Good News" of Jesus Christ. Amen to that! 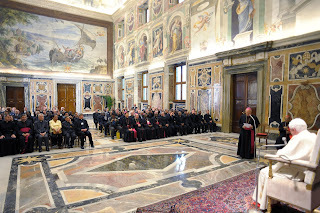 NOTE: Visit and watch the Catholic News Service video -- from May 14 -- about the meeting of National Directors, including comments by Father Andrew. Father Small, As you retold of your adventures, the humor and energy flowed through to some degree of note. It must have been both exciting and overwhelming; but from your BIO - the Pope had to have known of you and of what to expect from the US and our support. Therefore, I would have bet that he was just as impressed of you as you were of him. In light of that, and of your impending mission, I wish you great luck. enlightening us on the inter-working of the Church is a great thing for transparency and leadership. I am new to this approach of blogging - with an dabout the Church, but pretty cool to use such technology to grow commitment.